From early in 2009 until the middle of 2013, I was continually pregnant or breastfeeding. That's over 4 years of sharing my body with babies! 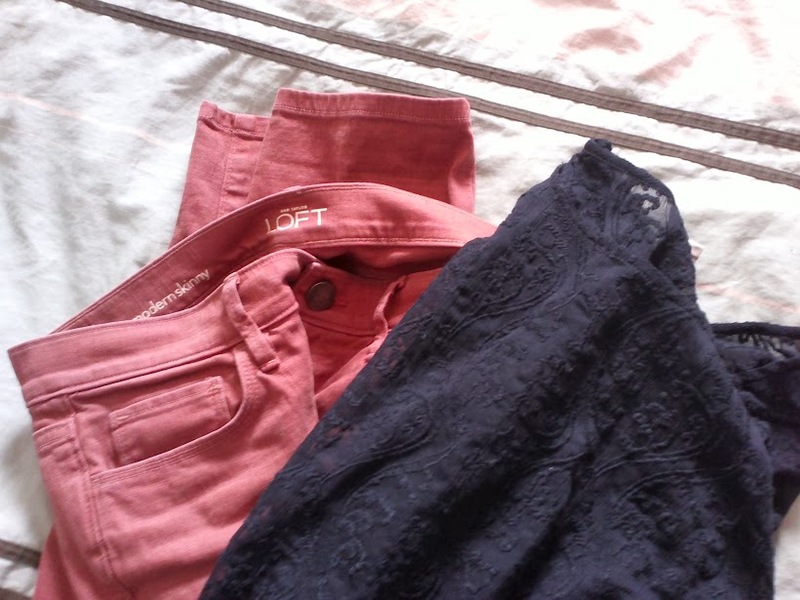 During that time I bought very few clothes because my body was constantly changing shapes and sizes. In that entire four years, I bought a week's worth of maternity clothes, a couple nursing tops, a few dresses for weddings and baptisms, and maybe a couple sweaters and jeans. Not much at all. So now that I have emerged (not the same shape as I started), I have nothing to wear! 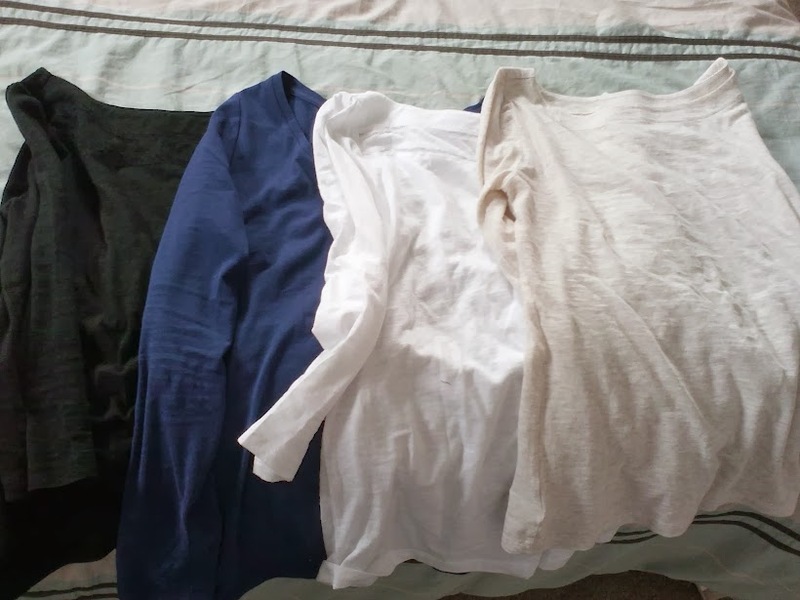 I fell into this trap of just wearing tee-shirts and long sleeved tee-shirts that I had acquired through high school and college. I finally realized that this was taking a toll on my confidence. I needed some clothes worth of a 31 year old! On Saturday morning I was stressing about what I would wear for a swing dance we were going to that evening. John told me that I should go shopping. Instead of turning down the offer like I usually do, I accepted. 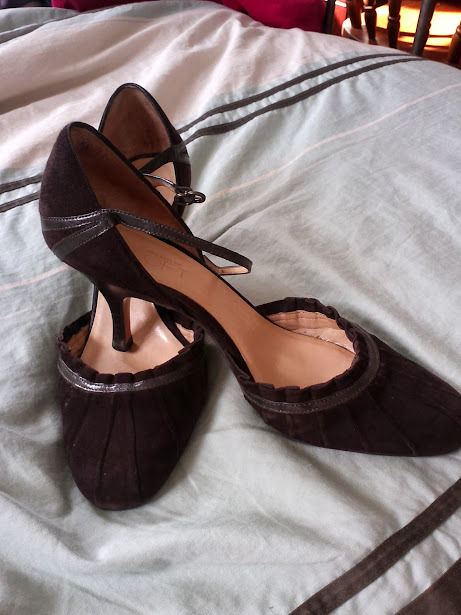 I headed to my favorite shop, Ann Taylor Loft and went straight for the clearance and final sale items. Let's look at some quick takes of my finds! 1. So first things first, I needed an outfit for that evenings festivities. 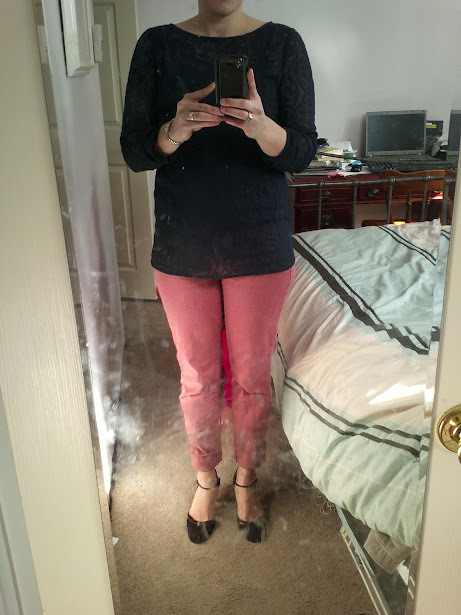 I was looking for a dress, but ended up with a pair of coral skinny jeans ($15) and a navy lace top ($5). Ignore all the kid smudges on my mirror! 2. Next up, I needed some basic fitted shirts that I could wear instead of my tees. I found four, three of which were $7 each and one for $9. 3. 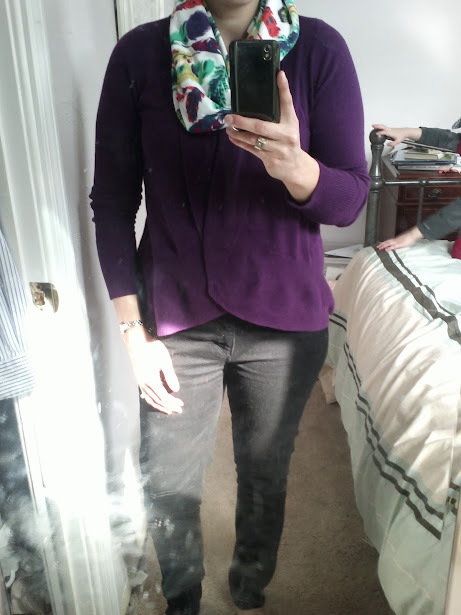 A few of my facebook friends had recently shared a blog post about dressing for the stay-at-home mom. The post encourages SAHM's to use the "rule of 3" to look more pulled together. I.e. you want to be wearing at least three things - shirt, pants and something else, like a chunky necklace, vest or scarf. 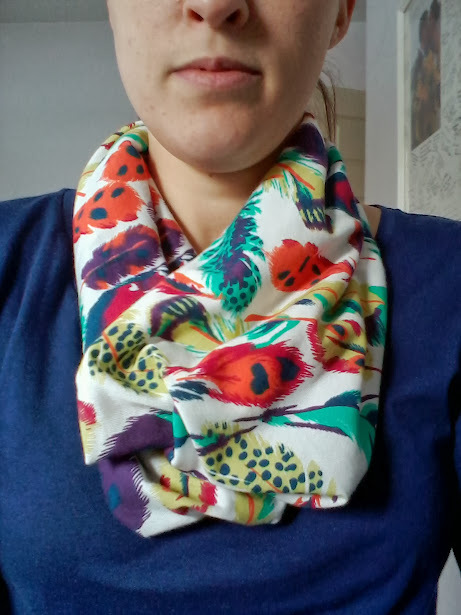 I don't do jewelry and I'd already been pairing vests with my tee-shirts without success, so I needed some scarfs! 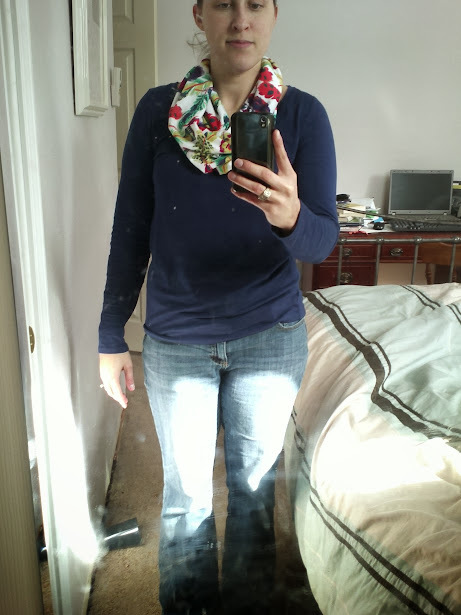 A friend of a friend sells homemade stuff on instagram, so I ordered this infinity scarf ($10) from her. 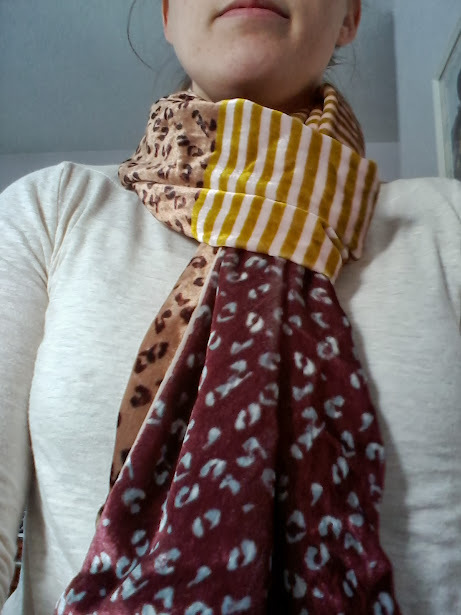 New scarf with new shirt! It also goes well with purple! 4. And the last thing I looked at before leaving Loft was the scarfs. I found this beauty for only $5! 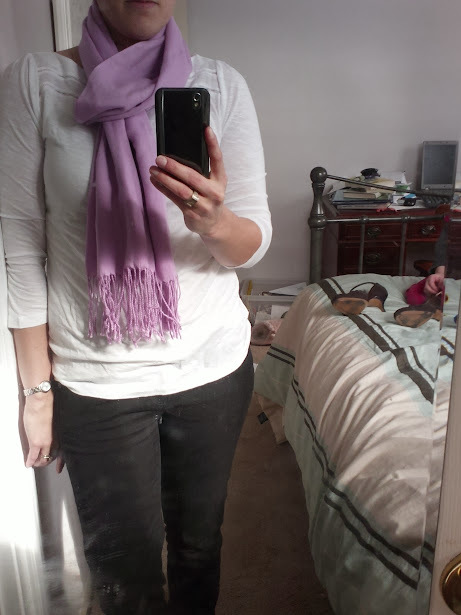 New scarf, new shirt, new pants! 5. 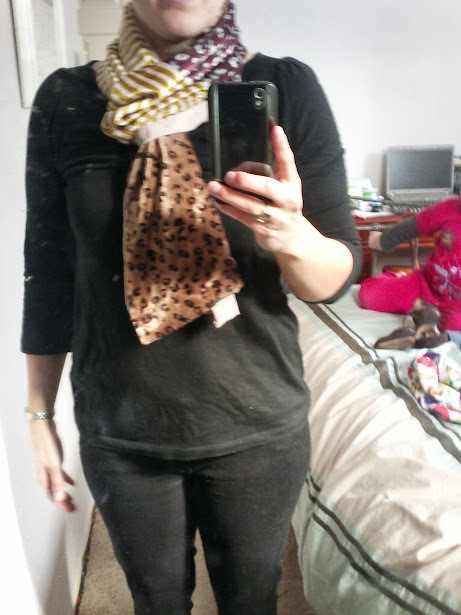 Upon returning home I also dug out a pretty pink scarf that I have had for a while! 6. 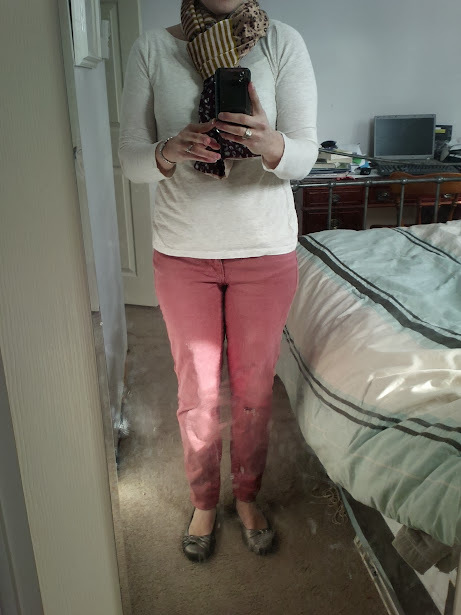 I may have $65 less now, but a whole lot more confidence :-) I still need to get a pair of well fitting jeans, so I'll probably head back to Loft in March with the $25 off of $50 coupon that they gave me at checkout! 7. 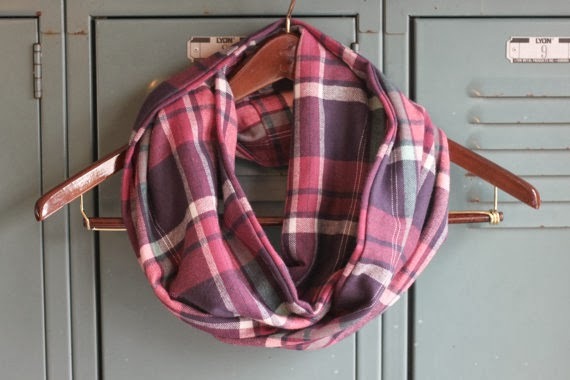 Oh, and I got one more fun addition that hasn't arrived yet... a flannel infinity scarf from an Etsy shop I discovered on Instagram, Eclectic Joy!